New York, N.Y., April 13, 2017 — Our country—and world—is divided, or so say the talking heads and headlines. 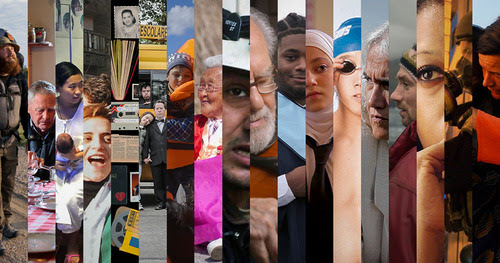 As newsfeeds and timelines update in rapid-fire succession and phones buzz with ever-constant breaking news, POV’s 30th season steps in, presenting powerful stories from the unseen and unheard, and from seemingly distant and disparate communities. From Syrian immigrants adjusting to life in Los Angeles, to North Carolina’s rural black community, to suburban police forces navigating rising tensions in their neighborhoods, these films offer a timely montage of diverse stories threaded together by universal desires for inclusion, success and safety. The 30th season of POV begins Monday, June 26, 2017 at 9 p.m. (check local listings) on PBS with streaming at pov.org and continues with broadcast premieres airing on Mondays at 10 p.m. through fall 2017, with primetime specials airing in 2018. POV is American television’s longest-running independent documentary series. The season kicks off with a series of films on the Syrian war and the ongoing global refugee crisis. The first, Dalya’s Other Country, follows a young Syrian girl and her mother displaced by the conflict at home as they adjust to their new life in Los Angeles. The feature doc will premiere with two shorts, 4.1 Miles, an Oscar®-nominated short spotlighting a small Greek town on the sea and the coast guard’s daily efforts at saving thousands of migrants crossing the Mediterranean. For some refugees, new beginnings bring hope and opportunity. In From Damascus to Chicago, two young Syrian siblings resettle in Chicago and enroll in a dance class, while their family navigates a new city and new country. The special series turns to the collateral damage of the Syrian civil war with The War Show and Last Men in Aleppo. Captured through the lens of radio host Obaidah Zytoon, The War Show is a wrenching chronicle that starts with the country’s protests in 2011 and the youth that fueled them, then follows its descent into violent conflict. Last Men in Aleppo unveils the war’s terrifying aftermath, and the volunteer rescue workers and first responders known as the White Helmets who stayed behind to pull their neighbors from the rubble. Back in the United States, POV brings the spotlight to overlooked communities across the country. In Raising Bertie, African-American boys come of age in rural North Carolina, and in Memories of a Penitent Heart, a filmmaker digs into her family’s past to reconstruct the life of her late uncle, whose Catholic and Puerto Rican family spurned him as he expressed his gay identity in New York in the midst of the AIDS epidemic. Recent developments in the criminal justice system also take center stage this season. Tribal Justice delves into the practice of restorative justice—championed by two Native American judges in California who emphasize rehabilitative and personal interventions with youth threatened by the school-to-prison pipeline in their community. Other insights into our justice system are more threatening in Do Not Resist, which depicts municipal police forces that are rapidly militarizing with the blessing of the federal government. Communities don’t live in isolation, however, and two films showcase remarkable cross-cultural connections spanning the globe and through generations. In Presenting Princess Shaw, Samantha Montgomery, a caretaker at a New Orleans nursing home by day, moonlights as a singer and songwriter under the stage name Princess Shaw. Her dreams of stardom come that much closer to reality when an Israeli producer and international YouTube star discovers her on the video-sharing site. In the Oscar®-nominated short Joe’s Violin, a violin donated at a school instrument drive becomes the unlikely catalyst for a friendship between a 91-year-old Jewish Holocaust survivor and a 12-year-old Bronx schoolgirl. Two films focus on the lives of those with developmental disabilities, as well as their hopes and dreams for the future. In The Grown-Ups, middle-aged adults with Down syndrome yearn for independence, while in Swim Team, adolescent swimmers on the autism spectrum—and their parents—find a place of inclusion and understanding. POV’s 30th season also celebrates, and contemplates, the passage of time. In Motherland, a glimpse into the world’s busiest maternity ward, located in the Philippines, captures the hopes and challenges that come with motherhood and depicts newborns’ first days. Other films capture people at the twilight of the lives. Shalom Italia is a surprisingly light-hearted journey undertaken by three Italian-born Jewish brothers who, 70 years after emigrating to Israel, endeavor to find the Tuscan cave where they hid to evade the Nazis. In My Love, Don’t Cross That River, an elderly Korean couple live every day like newlyweds, even though they have been together for 76 years and must face the reality of aging. In Cameraperson, celebrated director Kirsten Johnson weaves vignettes of past filmmaking works into a moving tapestry of memories lived and experienced. June 26, 2017 at 9 p.m. In the documentary short, From Damascus to Chicago, two young Syrian siblings recently resettled in Chicago enroll in a dance class, while the film follows their family’s experiences in navigating a new city and country. After five years of war in Syria, the remaining citizens of Aleppo are getting ready for a siege. Through the eyes of volunteer rescue workers called the White Helmets, Last Men in Aleppo allows viewers to experience daily life, death and struggle in a place where people are fighting for sanity and where war has become the norm. Winner, 2017 Sundance World Cinema Grand Jury Prize for Documentary. Samantha Montgomery placed her dreams on YouTube. Then they became a reality. Presenting Princess Shaw is the extraordinary story of an aspiring musician, down on her luck, who inspired internationally famous musician, composer and video artist Ophir “Kutiman” Kutiel to create a magical collaboration that would introduce her talent to a whole new audience. Nominated, 2017 Critics’ Choice Award for Best Music Documentary. In Shalom Italia, three Italian Jewish brothers set off on a journey through Tuscany, in search of a cave where they hid as children to escape the Nazis. Their quest, full of humor, food and Tuscan landscapes, straddles the boundary between history and myth—a profound, funny, and endearing exploration of individual and communal memory. In the Oscar®-nominated Joe’s Violin, a donated musical instrument forges an improbable friendship between 91-year-old Holocaust survivor Joe Feingold and 12-year-old Bronx school girl Brianna Perez, proving that the power of music can bring light in the darkest of times, and that a small act can have a significant impact. Nominated, 2017 Academy Award for Best Documentary Short Subject. Filmmaker Cecilia Aldarondo suspected that there was something ugly in her family’s past. Memories of a Penitent Heart excavates a buried conflict around her uncle Miguel, who died at a time when AIDS was synonymous with sin. As she searches for Miguel’s partner decades later, the film—both a love story and a tribute—offers a cautionary tale of how faith can be used and abused in times of crisis. In Tribal Justice, two Native American judges reach back to traditional concepts of justice in order to reduce incarceration rates, foster greater safety for their communities and create a more positive future for youth. By addressing the root causes of crime, they are modeling restorative systems that are working. Mainstream courts across the country begin to take notice. Raising Bertie is an intimate portrait of three African-American boys as they face a precarious coming of age in Bertie County, North Carolina. Like many rural areas, Bertie County struggles with a dwindling economy, a declining population and a high school graduation rate below the state average. This powerful vérité film weaves the young men’s narratives together as they work to define their identities and grow into adulthood while navigating complex relationships, institutional racism, violence, poverty and educational inequity. In a school for individuals with Down Syndrome, four middle-aged friends yearn for a life of greater autonomy in a society that marginalizes them as disabled. The Grown-Ups is a humorous and at times sad and uncomfortable look at the tragic limbo of conscious adults. Winner, Best Female-Directed Film at the 2016 International Documentary Film Festival Amsterdam. On the isolated North Atlantic archipelago of the Faroe Islands, the longtime hunting practices of the Faroese are threatened by dangerously high mercury levels in the whales, decimated seabird populations and anti-whaling activists. The Faroe islanders consider themselves a canary in the mine, their tale a warning to the rest of the world. Winner, 2016 DOC NYC Grand Jury Prize. Spouses 89-year-old Kang Gye-yeol and 98-year-old Jo Byeong-man have shared a home for 76 years. While Kang and Jo spend every day together like a newlywed couple, they now must face the reality of their aging romance. My Love, Don’t Cross that River captures the fleeting moments of their twilight days. In an attempt to put haunting combat experiences behind them, two friends embark on an epic 2,700-mile trek on foot across America, seeking redemption and healing as a way to close the moral chasm opened by war. Almost Sunrise is an intimate, vérité film that eschews stereotypes and instead captures an unprecedented portrait of veterans—one of hope, potential and untold possibilities. A boxing match in Brooklyn; life in postwar Bosnia; the daily routine of a Nigerian midwife; an intimate family moment at home: these scenes and others are woven into a tapestry of footage captured over the twenty-five-year career of cinematographer Kirsten Johnson. A work that combines documentary, autobiography and ethical inquiry, Cameraperson is a thoughtful examination of what it means to train a camera on the world. Official Selection of the 2016 Sundance Film Festival. A vital and influential exploration of the rapid militarization of the police in the United States, Do Not Resist puts viewers in the center of the action—from a police training seminar that teaches the importance of “righteous violence” to the floor of a Congressional hearing on the proliferation of military equipment in small-town police departments. Winner, 2016 Tribeca Film Festival Best Documentary Feature Jury Award. POV films have won 36 Emmy® Awards, 19 George Foster Peabody Awards, 12 Alfred I. duPont-Columbia University Awards, three Academy Awards®, the first-ever George Polk Documentary Film Award and the Prix Italia. The POV series has been honored with a Special News & Documentary Emmy Award for Excellence in Television Documentary Filmmaking, three IDA Awards for Best Curated Series and the National Association of Latino Independent Producers Award for Corporate Commitment to Diversity. Learn more at www.pbs.org/pov.